In summer 2001 I was fortunate enough to receive and invitation for a private visit to Château Haut-Brion in Pessac-Leognan, in the southern suburbs of the city of Bordeaux. Château Haut-Brion’s red wine is one of Bordeaux’s five Premiers Crus, the very expensive elite of Bordeaux. They also produce a magnificent Bordeaux blanc, and a small stable of other wines including the equally illustrious Château La Mission-Haut-Brion, a separate Château, sited just across the road from the beautiful Haut-Brion. Jean-Bernard Delmas has been in charge of winemaking here for forty years; a position he inherited from his father. I was delighted that we were joined by Jean-Philippe, Jean’s son and heir to the role of chief winemaker. Both were born and raised at Haut-Brion, and clearly have a huge affection for the estate that goes far beyond mere business. 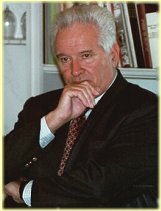 Jean-Bernard concedes that in his early days the Château lost money as investments were made, but that the owners, the American Dillon family, were unstinting in their support. He has enjoyed that support ever since, and his retiral in a few years time will doubtless be a huge wrench. One suspects he may continue to have some input on how Jean-Philippe does things. Constantly innovating, Haut-Brion caused quite a stir when they became the first classed growth estate to install stainless steel vats in 1961 (a practice now followed by many). Today, an extensive programme of vine cloning is a passion of M. Delmas, to establish vines that will produce optimum and reliable results from their various vineyards. Jean-Bernard explains that one Cabernet Sauvignon vine may regularly yield more grapes than its neighbour. And the properties of the grapes – sugar, colouring, aroma and tannins – may vary greatly between vines even of the same species. Hence his near obsession with the clonal programme, which commenced in 1977, and which seeks to breed the perfect Cabernet or Merlot for each of Haut-Brion’s distinct vineyard terroirs. 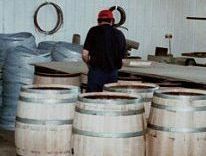 Just one aspect of the obsessive quality control that is evident throughout the estate, as recently as 1990 the Château began to employ their own, on-site tonnelier to make and toast barrels to their exact specification. The vineyards are “green-harvested”, thinning out bunches on the vine during the growing season, but with great care: Delmas is not looking for “super-concentration” in his wines, but for elegance and balance. I ask if the wines have changed noticeably over Jean-Bernard’s 40 years in charge. His answer is a resounding yes: thanks to better viticultural practices and a better understanding of vines and the ripening process, grapes are picked with increased ripeness of both fruit and tannins. Haut-Brion today drinks earlier than 40 years ago (there is no need to cellar it for 15 years before broaching the bottle), but that is not to say the wine has been dumbed-down or made less “seriously” for a modern market. M. Delmas is still utterly confident that a good vintage will last as long as it ever did, improving all the time. He says the drinking window for great Bordeaux has been extended; not re-positioned earlier. The Château’s records also suggest that global-warming is having an effect on the vineyards, with subtle but consistent changes in climatic conditions over the past few decades. Jean-Philippe is currently Commercial Director at Haut-Brion, but has completed wine-making stints in California, Provence and Champagne, as well as on-the-job training with his father of course. He expresses his gratitude to Jean-Phillipe Masclef, cellarmaster at the Château for many years. Jean-Philippe sees his impending responsibility as the Château’s winemaker as one of continuing the work of his father and grandfather, rather than anything revolutionary. I have been lucky enough to taste a dozen vintages of Haut-Brion, including a vertical tasting with Jean-Bernard. Here we tasted 2000 barrel samples, so the usual caveats apply for unfinished wines. Joining us for the tasting was Murphy, Jean Delmas’ black labrador who waits anxiously to chew on any paper napkins used to mop-up left-over Haut-Brion! 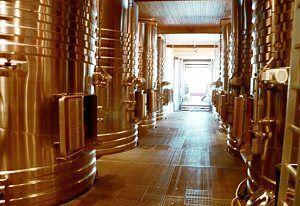 There is excellent information on Haut-Brion’s Web site. Beautifully limpid, clean, fresh pear and peach aromas, little hints of ripe pear skins. Lovely, buttery weight of fruit on the palate with melon and white peach flavours, good weight and lots of juicy, thick-textured quality in the mouth. A little creamy oak rounds out the finish, adding a custardy appeal to apple acidity. Extremely promising indeed. Vanilla and sweet apple-pie aromas over wonderfully juicy fruit. Notes of honey and butter, lanolin, honeysuckle and pear. The palate has masses of unctuous apricot and nectarine fruit, with pear and ripe peach aromas. There are hints of marzipan and almond, with a graceful, beautifully pure acidity and terrific length. Outstanding. This is the second wine of La Mission-Haut-Brion. The vines here ripened earlier than in the Médoc, by a full two weeks. This has a good colour, and a lovely quality of deep, plummy fruit on the nose, cedary nuances and lots of blackcurrant and chocolate richness. The palate has fine, sweet blackcurrant fruit with a plum-skin bite of acidity and good, sweet tannins. Long and very pure, it finishes with style. Very good indeed. Always one of the best second wines, Bahans is the little brother of Château Haut-Brion. The vineyards are big gravel and pebbles on a clay base. This has a beautifully sweet, rounded, rich nose with more obvious oak influence than the La Chapelle at this stage, and a creamy quality to blackcurrant fruit. The palate is very fine, with a lovely quality of fruit and superb, juicy acidity. Firm tannins kick-in on the finish, but there is great depth here and very good length. Very good indeed. Another separate vineyard site near La Mission-Haut-Brion. This has a terrific nose, with lots of dense berry fruit that is quite earthy, with rounded mulberry and bramble notes and hints of smoke and chocolate. On the palate it is full-bodied and concentrated, with juicy black fruit and a chocolaty depth, just a hint of minerality at the core. Elegant and long, there is good acidity and firm tannins lending an air of seriousness. Good length and very good indeed. Until the Dillon family bought La Mission-Haut-Brion in 1984, it had been their greatest rival. 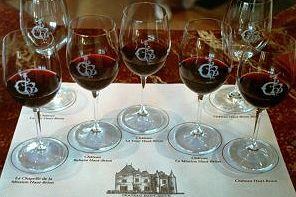 With re-equipped cellars in 1987, La Mission has gone on under Jean Delmas direction to become an equally sought after wine. There’s a gorgeously rich, bramble depth on the nose and wonderfully sweet, fragrant plum fruit with notes of cherry and blackcurrant, tobacco, toast and chocolate. Powerful tannins on the palate, and a silky textured weight of fruit. Fine balance with the sweet tannins and oak bolstering the long finish. Outstanding. Fantastically rich, round, dense and earthy nose full of cherry, spice, violets and delicate floral nuances. There’s a characteristic mineral element too. Beautiful chocolaty tannins coat the palate in a full-textured format with superb weight of fruit that is savoury and black, with hints of tobacco, olive and woodsmoke. Though a little more tightly-structured than La Mission at this stage, still beautifully ripe in fruit and tannins, with a fine acid structure completing a picture of complexity and genuine quality. Outstanding, and my top wine of this wonderful line-up. After I had given my humble opinion on the wines, M. Delmas told me that he too felt Haut-Brion had just pipped La Mission in this vintage, though some commentators have awarded slightly higher scores to the latter. My thanks to Jean-Bernard and Jean-Philippe Delmas, and to Prince Robert of Luxembourg for arranging this visit.